This book two in the “Love is . . .” series by Prism Book Group. Gay Lewis often writes about a ditzy but sweet angel, but that’s not Clue Into Kindness is about. This story is about Georgia. She really loves her hubby but he’s really kind of a class-A jerk. She responds to every cutting remark with kindness. I’d like to bite him for every cruel comment and remark he makes to his wife. And she takes it? I don’t get it and neither does her best friend Jana who really would like to slap the guy. But her husband tells her that’s not really who Ken always was. Georgia has work to do that gives her more positive feedback. Especially when a handsome business owner wines and dines her and offers her a job . . . and possibly more? Georgia backs away although given the way she’s treated at home, she’s very tempted. But as a follower she could never betray her husband like that. Although who could blame her. Things change when they gather to celebrate her father-in-law’s birthday. While Georgia is away from the table, Alan hears some hard truths but he refuse to believe them. He follows up and God gets ahold of his heart . . . But can Georgia really accept that kind of change? Can she forgive all that verbal abuse and trust that the man she vowed to love and has stayed faithful to really has changed? Guess you’ll have to read to find out. I like light-hearted stories and this was not one of them. But to shine a light on the subtle and yet devastating abuses that can take place even in a Christian marriage through verbal abuse is a good thing to explore. I still wish Georgia hadn’t been so much of a doormat but maybe if it had continued, in time, she would have recognized it for what it was. This story illustrates “Love is kind” from 1 Corinthians 13 and what better way to do that than set it up against someone so blatantly unkind and in a relationship that is hard to leave. Romance? Not so much, but a difficult story of loving in spite of another’s choices, this book definitely hits the mark for that. I’ll give it four bones (I’m a dog, I don’t do stars) for tackling an uncomfortable issue and a happy ending. It’s a novella so it’s short. A longer book might have explored this even further, but might have also been harder to read from an emotional standpoint. Meet Renata Blake. 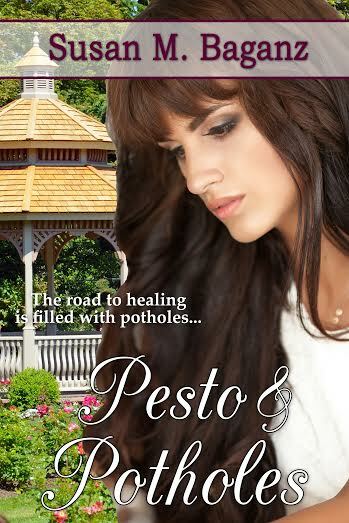 Her story is featured in the novel Pesto and Potholes releasing March 27, 2015. Renata, how do you feel about your story being told? Initially I wasn’t too happy about it. I’ve had plenty of bad press in the past and the last thing I need is my family getting wind of this book. They already hate me enough . . . and they don’t come out looking too good in the retelling. But it is real. This is my life. All the ugliness and the beauty. What do you hope will be the outcome of your story being shared in this way? That those who are hurting would find hope. As the book cover says, “The road to healing is filled with potholes.” Also that if someone isn’t involved in a good church, that they would seek one out. The relationships I made at Orchard Hill Church were a significant part of my healing process. *giggles* Tony is sweet and handsome, but more than that, he always respected me. That was so new for me to experience. I heard about that book and movie that came out, Fifty Shades of Grey. That’s not love. Trust me, no woman wants a man who is going to control and abuse her. But Tony, he’s one of the good guys and he loves Jesus which I think made a huge difference. I’ve always loved Italian food . . . but I have a far deeper appreciation for it now. *she winks*. Do you still battle ninjas? (sly grin). I haven’t had the occasion to lately, but suspect I’m still capable. I’m excited that my roommate Stephanie gets a chance to tell her amazing story next. I don’t know if I could have made it this far without her love and support and I’m glad I got to return the favor when life became difficult for her. I don’t want to give any spoilers away. One last question. What’s your favorite song right now? Oh, wow. I love so many but the one that resonates most with my soul is Broken Hallelujah by the Afters. If I were a songwriter, I could have written that song. Hallelujah means to “God be praised,” and I’m grateful that even when I was weak and broken He could still hear and accept my shattered heart. I look back now in such gratitude for all He’s done. May all the praise and glory be to Him. Thank you, Renata, or taking the time out of your crazy schedule. Thank you for sharing about Susan’s book. I’m so grateful she had the courage to tell my story. Maybe others will find healing and hope in Jesus because of it.